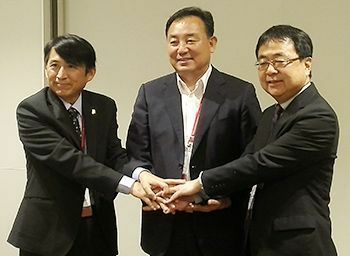 On August 29, the Okinawa Prefectural Government (OPG), Keelung Port of Taiwan, and the Jeju Special Self-Government Province of South Korea concluded a memorandum regarding cruise promotions. The three parties will cooperate to take part in activities to promote and attract cruise line companies. A ceremony was held on Jeju Island, South Korea. The memorandum included: increasing the number of stops at ports by proactively accepting the cruise ships from each other’s port, cooperating with one another’s tourist promotions, exchanging cruise-related information, and participating in events like business meetings. Many cruise ships arrive at Okinawa from Keelung, so both parties will continue to deepen their partnership. Jeju Island, which does not have a direct route to/from Okinawa, aims to create new cruise routes. The “East Caribbean Plan,” which was drawn up this past March, includes deepening the partnership related to domestic/international ports, local government, and promoting tourism.